Hope you've all had a fantastic weekend? I've enjoyed a beautiful Sunday at home with my family and wow - where did that beautiful weather come from? The sun was actually hotter than back in July, which was a welcomed treat. During the week I tend to wear longer lasting make-up looks, as I work in a fast paced Marketing environment and a day can literally change in seconds. 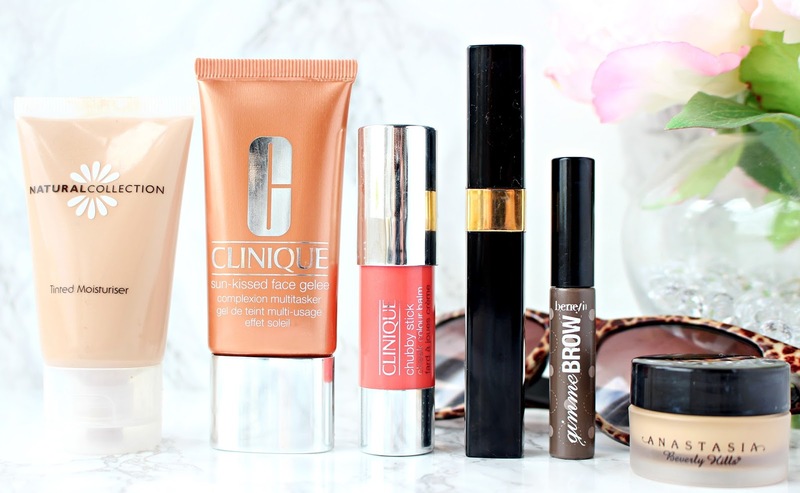 However, in my free time I like to wear a much more natural look, so I thought I would share a short but sweet sneak peek of my favourite beauty products that I use to create a no makeup makeup look. Once I've finished my skincare routine, I reach for my Natural Collection Tinted Moisturiser (£1.99) and my Clinique Bronzing Gelee (£23), which mixed together create a beautiful, yet lightweight base that really gives you that soft focus lit within look. Once I've sorted my base I apply some of my Anastasia Beverly Hills Concealer (£20) just under my eyes to give me the coverage I need... damn you dark circles! Next up I reach for my Benefit Gimmie Brow (£18.50), which is pretty much on its last legs - However, a few swooshes of this across my brows really gets them into shape, with little to no effort...bingo! Even though this look is pretty minimal, I don't think any look would be complete without a few flicks of mascara to open and awaken your eyes. I'm currently using the Chanel Dimensions De Chanel Mascara (£25) which is amazing at adding volume and dimension without clumping at all. Last but not least I reach for a cream blush opposed to a powder to keep that natural glowy look. I love the Clinique Chubby Cheek Stick (£19) in the shade Roly Poly Rosy, which I also use on my lips to match up and complete my look! So that's it lovelies - My go to effortless make-up look that makes me feel confident, without having to dig out anything too heavy duty!